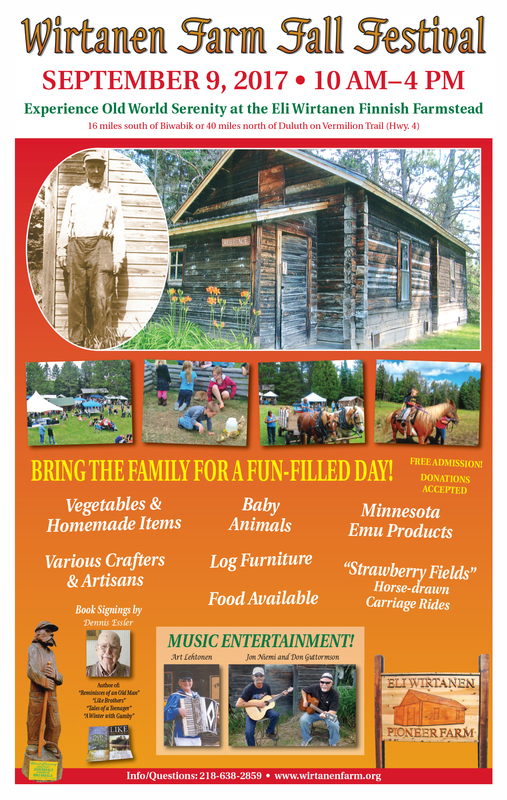 Come join us for the Wirtanen Farm Fall Festival. This event will take place on Saturday, September 9, 2017 from 10 am to 4 pm. As always, this event is free for everyone and is made possible by all the volunteers and artisans. Strawberry Fields draft horses will be at the farm and with carriage rides. Musicians performing under the tent throughout the day include Art Lehtonen, Jon Niemi and Don Guttormson. For the children there will be baby animals. Local author, Dennis Esler ,will be available for book signings. Crafters and artisans will be on the farm grounds demonstrating and selling their wares. We are holding a silent action. It is for a woodburned stool, crafted by Avery Brown. You can view the stool at the welcome table near the main house. We are accepting bids which will carry on through the bake sale in November.